Made for around $50,000 and single-handedly produced, directed, filmed, edited and narrated by BRUCE BROWN, THE ENDLESS SUMMER is far and away the most successful surf movie of al time, and still the standard bearer for all surfing documentaries, the alpha and omega by which all others are measured. Its creator, Brown, was little known outside the limited confines of the surfing subculture, which in 1966, the year of the film’s release, was familiar to most Americans through the distorted lens of Beach Party movies and a surf music craze that had been on the wane since the British Invasion of 1964. As PAUL HOLMES writes: “Wholesome, charming, corny at times, but with what film critic Leonard Maltin describes as a ‘diverting, tongue-in-cheek narration,’ the film’s premise–a quest for the holy grail of a perfect wave–gave surfers some noble dignity at a time when they were often stereotyped as derelicts, ne’er do wells or delinquents. But the stars of The Endless Summer, Robert August and Mike Hynson, came across as clean-cut, fun-loving athletes and surfing itself as a grand, healthy, respectable sport with unexpected global appeal.” Brown and his crew literally followed Hynson and August around the world, chasing the sun and the summer as it crossed the planet, as the pair tested out some spots–such as Hawaii–famous for big waves, and others–such as Acra, Ghana–where surfing was completely unknown to the natives. 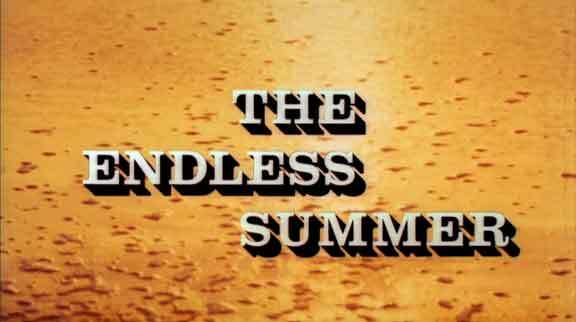 With an evocative soundtrack by The Sandals, the feel of The Endless Summer is as idyllic as its protagonists’ journey is romantic–a near-perfect mating of existential ambition depicted on screen and spiritual/metaphysical striving expressed in music. PAUL HOLMES captured the whole epic saga in this definitive piece first published in the now-defunct Longboard surfing magazine in 2005. CLICK HERE TO GO TO THE FULL STORY IN PDF FORM.